Mother Nature has been teasing us the last few days and decided to remind us who is in charge after our blog yesterday regarding breakup. We have seven inches of snow and counting here at Junior Towne this morning. Please remember that we have a good selection of winter hats, mittens, boots and snowsuits that we keep around just for occasions such as this. 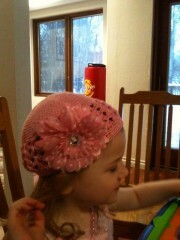 On another note, one of our grandmothers sent in this picture of her granddaughter modeling the new crocheted hat with flower bow that she bought the other day. These mix and match combinations are are lots of fun. Now I need to go out and shovel our sidewalk! ….or is the weather just teasing us? 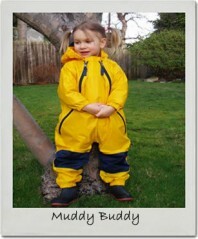 At any rate we have a great selection of Muddy Buddy’s in stock. The Muddy Buddy is a one piece, light weight waterproof and breathable playsuit which keeps kids clean, dry and comfortable. It is perfect for our Alaskan weather during Breakup or our summer sometimes known as our rainy season. We have had customers come in and tell us that they have used them for really messy art projects, too! 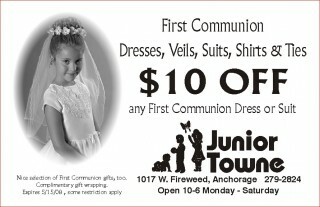 Looking for a special First Communion outfit? Print this coupon and bring it in! Our annual school uniform and dress code sale is Friday and Saturday, Feb. 12 & 13. All in-stock uniform pieces will be 25% off. Pants-jumpers-skirts-shirts-sweaters-blouses: take advantage of our two day special. It only happens once a year. 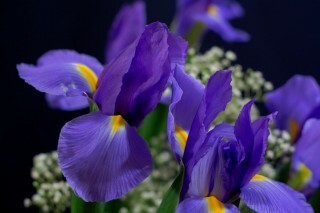 I thought that we needed a reminder of spring today. 25% off anything with a heart on it! A quick check around the store revealed a lot of hearty material-sleepers, t-shirts, shoes, nightgowns, socks, jewelry…those are just a few of the things I found! The possibilities are endless. Come search to your heart’s content! Happy Valentines Day! Our Hearts Away Sale ends Feb. 14. PS-The logo for Roxy Girl is a heart. Kind of puts it all in a nutshell, doesn’t it? Check them out. You are currently browsing the Junior Towne Blog weblog archives for February, 2010.